Metal-organic frameworks (MOFs) are among the most useful and versatile materials today, demonstrating structural versatility, high porosity, and fascinating optical and electronic properties. These characteristics make them promising candidates for a variety of applications, including gas capture and separation, sensors and photocatalysts. Because MOFs are so versatile in both their structural design and usefulness, materials scientists are currently testing them in a number of chemical applications. One of these is photocatalysis, a process in which a light-sensitive material is excited with light. The absorbed excess energy dislocates electrons from their atomic orbits, leaving behind "electron holes." The generation of such electron-hole pairs is a crucial process in any light-dependent energy process, and in this case, it allows the MOF to affect a variety of chemical reactions. 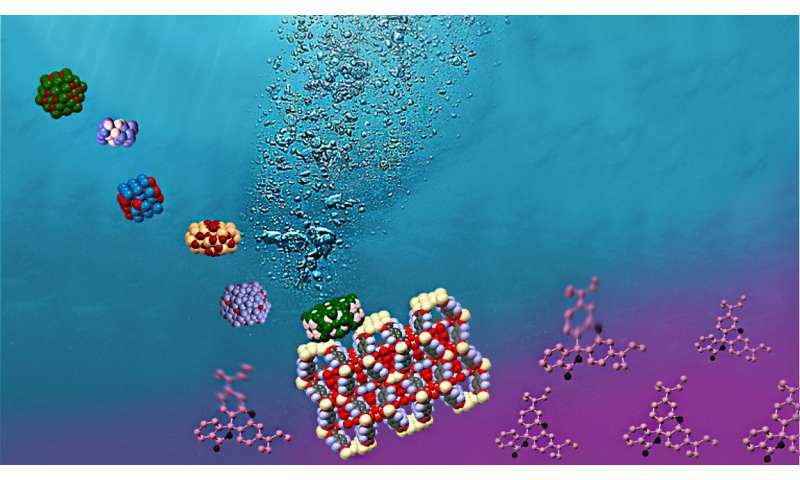 A team of scientists at EPFL Sion led by Kyriakos Stylianou at the Laboratory of Molecular Simulation has now developed a MOF-based system that can perform not one, but two types of photocatalysis simultaneously: the production of hydrogen and cleaning pollutants out of water. The material contains cheap, abundant nickel phosphide (Ni2P), and was found to carry out efficient photocatalysis under visible light. The first type of photocatalysis, hydrogen production, involves a reaction called "water splitting." Like the name suggests, the reaction divides water molecules into their constituents hydrogen and oxygen. One of the bigger applications here is to use the hydrogen for fuel cells, which are energy-supply devices used in a variety of technologies today, including satellites and space shuttles. The second type of photocatalysis is referred to as "organic pollutant degradation," which refers to processes breaking down pollutants present in water. The scientists investigated this innovative MOF-based photocatalytic system towards the degradation of the toxic dye rhodamine B, commonly used to simulate organic pollutants. More information: Stavroula Kampouri, Tu N. Nguyen, Mariana Spodaryk, Robert G. Palgrave, Andreas Zuttel, Berend Smit, Kyriakos C. Stylianou. Concurrent Photocatalytic Hydrogen Generation and Dye Degradation Using MIL-125-NH2 under Visible Light Irradiation. Advanced Functional Materials 05 November 2018. MOFs suffer from severe hydrothermal instability. Fascinating materials with more or less zero industrial applications.